Note: This article has been updated. Please see the solution at the bottom of the article. 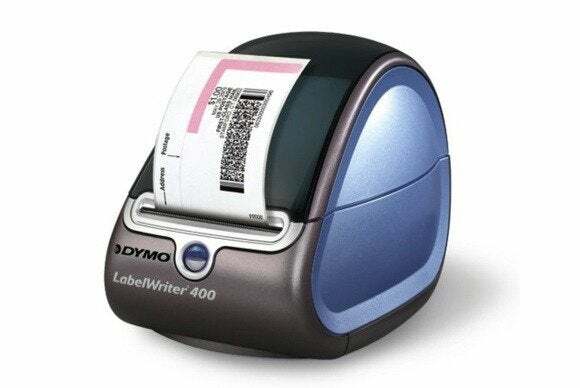 My Dymo LabelWriter 400 Twin Turbo died last month. Sort of. There was no hardware failure. As far as I can tell, all the hardware components remain in fine working order. Neither has there been any major shift in technology that would make the printer obsolete. So, in some sense, the printer is still very much alive. It’s just that it won’t print labels. You wouldn’t think that a minor OS X update, one that makes no mention of any printing-related changes, would precipitate this error. I certainly didn’t. That’s why, when the problem first appeared, I assumed it was a temporary glitch with the Dymo software—completely unrelated to the OS X upgrade. Such glitches had happened before… too many times before. So I went through the familiar drill of suggested fixes: unplugging and reconnecting the printer, deleting and reinstalling the driver, and ultimately completely reinstalling the Dymo software. This time, despite almost two hours of troubleshooting, the printer remained unresponsive. I couldn’t resist a tinge of snarkiness in my reply: “Now you tell me? Geez. Knowing that in advance would have saved us both a lot of time.” It would also have helped if Dymo posted this information to their website—or at least made certain that their technical support staff was aware of the matter. In other words, don’t hold your breath waiting for a fix that might never come. 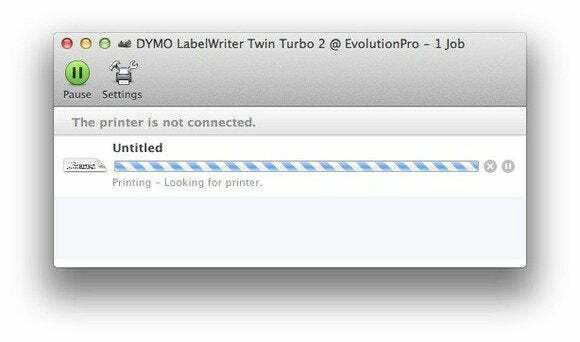 The tech went on to explain that Dymo’s current printers, the 450 series, do work fine with OS X 10.9.4. The problem was limited to just a “few older models,” of which mine was one. Another solution, therefore, would be to buy a new Dymo LabelWriter 450 Twin Turbo. Dymo was prepared to offer a 25 percent discount if I decided to go that route. As it turned out, the same printer was available at Amazon.com for a 50 percent discount ($100). So I declined Dymo’s not-so-generous offer and, with some reluctance, ordered the printer from Amazon. I can now confirm that the new printer does work with OS X 10.9.4; I’m printing labels again. Summing up, Dymo has failed here in several significant respects. To be fair to Dymo, I understand that a company cannot be expected to support older out-of-production hardware indefinitely. But this hardly seems to be a good example of when to opt out. The update from OS X 10.9.3 to 10.9.4 was a minor one. And, at least superficially, the differences between the Twin Turbo 400 and 450 seem small. It thus seems reasonable to assume that creating a fix would not be a significant drain on Dymo’s resources. If my logic is incorrect here, and the required fix is somehow a big deal, I would at least expect Dymo to offer some explanation on their website. Instead, they have gone the opposite route. Not only does their site make no mention of any of this (at least not as of the time I was dealing with it), but their first line technical support staff has similarly been kept out of the loop. In addition to the misinformed online chat technician, the person behind the @DymoSupport Twitter account at first assured me that my printer should work with 10.9.4. After further discussion with higher-ups, he later acknowledged that “some devices are indeed incompatible.” Postings at Apple Support Communities offer similar stories. Finally, Dymo's suggested solutions of either downgrading the OS X software or overpaying for a new printer, seem unhelpful at best. Update: I am pleased (and pleasantly surprised) to report that Dymo has fixed the incompatibility I’ve written about below. To get things working again, download the TwinTurboUpdater and follow its instructions. When I did this, my old LabelWriter was able to print again. Thanks Dymo! One more thing: If you’ve updated to OS X Yosemite, you’ll also need to get the latest (8.5.2.95) version of the Dymo Label application.